File photo of past action at Kanteerava Stadium courts. The Karnataka State Basketball Association will be conducting State Youth Basketball championship for Boys & Girls at Sri Kanteerava Stadium Basketball Courts, Bangalore from 11th May 2015. In this championship, 52 boys teams & 28 Girls teams will be participating from all over the state. Every state is mandated to conduct a youth basketball championship for U-16 players every year, in the run up to the annually held National Youth Basketball Championship. Southern neighbour Kerala has already concluded its championship, while in Maharashtra, Pune just conducted a district level version. 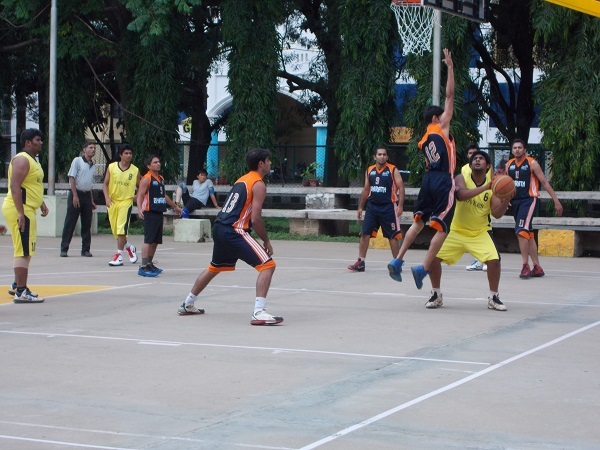 The outdoor courts next to the Kanteerava Stadium play host to almost all the major basketball state level events in Karnataka. Apart from the upcoming youth championship, the venue also hosts the State A, B and C Division champions. The Kanteerava courts also functions as the training ground for the Vijaya Bank Club team, the top senior side in the state that organises the Mulki Sunder Ram Shetty All India Club Tournament in the city. Hi Gopal, For your kind information there is no wooden surface inside the indoor Stadium at Present .we have to lay the Teraflex Mats till a new wooden surface is put up. Hello Gopal, can you please keep updating on the upcoming events,so it becomes easy for basketball enthu’s to watch them.it is really nice to watch U-13 Matches to see budding stars. Thanks for following our site. We usually put up details of upcoming events on the top right box of the home page. Currently, Maharashtra State is hosting its Youth Championship (http://ekalavyas.com/2015/05/20/maharashtra-youth-basketball-2015-2/). Other recents events that concluded are the Karnataka Youth Championship (http://ekalavyas.com/2015/05/19/karnataka-youth-basketball-concludes/) and the Kerala sub-junior championship (http://ekalavyas.com/2015/05/20/kerala-sub-junior-basketball-2015/). is there basketball coaching in kanteerva?? ?